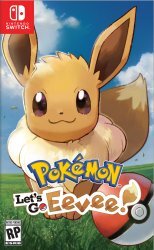 Pokémon Let's Go, Pikachu & Let's Go, Eevee are the first mainline Pokémon games on the Nintendo Switch. These games are remakes of and so are games set in the Kanto Region following an altered version of the game's story. 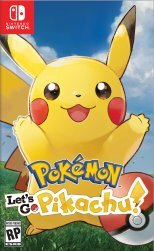 In the game, you get a specific starter Pokémon: Pikachu in Let's Go, Pikachu and Eevee in Let's Go Eevee. These partner Pokémon are with you always and cannot evolve. In addition to this, you can have other Pokémon of your team follow you in a manner akin to previous games. These games also include a Brand New Pokémon which can also be sent to Pokémon GO. These games feature co-op locally as well as a new device like a Poké Ball called the Poké Ball Plus that lets you take your Pokémon around with you in Pokémon GO and be used as a GO Plus. You can also send your Pokémon from GO to Pokémon GO Park to get them in Pokémon Let's Go Pikachu & Eevee. They can be played with just one Joy-Con and capture is done by flicking the Joy-Con like Pokémon GO. The game will feature online functionality for battles and trades and requires a Nintendo Switch Online subscription to play. It lacks the GTS, Wonder Trade and Battle Spot features of past Pokémon games.